The weather report was showing a few more warm fall days. It seemed like this was my last chance to fish before the real hustle and bustle of the holidays hit and the fishing fell into the doldrums of winter. I had been talking about a fishing trip, out loud to myself, and Denise must have overheard me. Monday she stuck a note on my side of the mirror saying how much she appreciated my help and what it meant to her, and finished by saying that she wanted me to stay around through Thanksgiving and not go fishing… took the wind right out of my sails. After checking my calendar and giving it some thought at work, I asked her if I could go Wednesday preceding Thanksgiving, a workday, if I promised to be home by 6:00 pm. I argued it would be just like a regular workday to her, and she said “yes”. So, after dropping Brian off at school I headed for Pine Valley. I picked Pine Valley for several reasons. 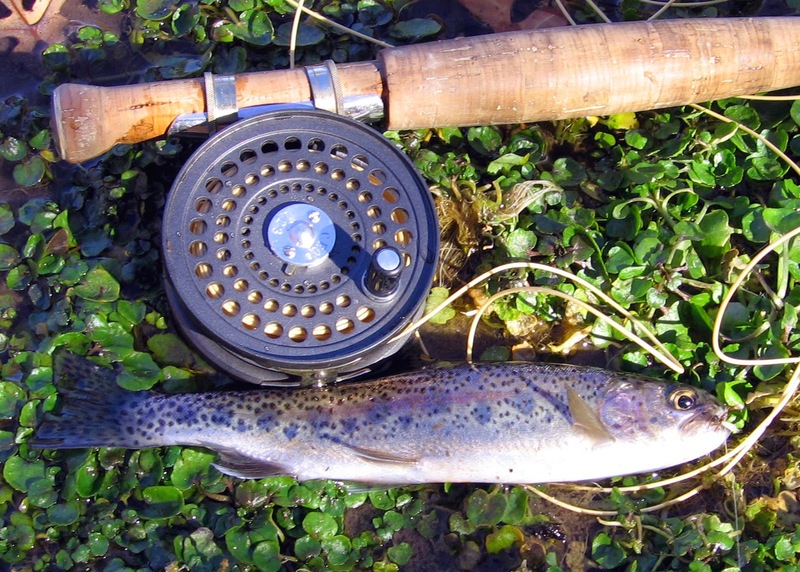 First, I had enjoyed recently fishing Cold Creek with my little six-foot rod. I wanted to try Santa Clara Creek below Pine Valley Reservoir. I had fished the creek many years ago in the spring, catching trout fishing’s Triple Crown: brook, brown, and rainbow trout. 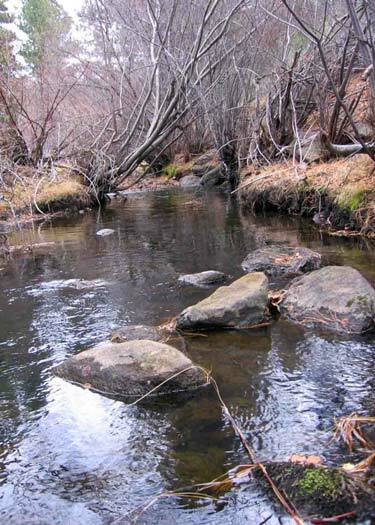 The creek, although small, did present a variety of fishing opportunities, from boulder-strewn pools to long, deep glides. I really wanted to catch brown trout in that creek, hopefully finding them still in their fall spawn colors. Second, I had heard that the Pine Valley reservoir was producing good late season fishing, with rainbows in the twelve to fourteen inch class. I reasoned that if the creek fished slowly I could fish the inlet of the reservoir. Lastly, Pine Valley is close; 160 miles that can be covered in two-and-a-half hours, making it a fairly decent one-day trip. I arrived at the creek just at 9:30am, assembled my six-foot rod, and proceeded to the creek. It was lovely, much like I had remembered it these past 25 years. I had difficulty presenting flies to the boulder pools because of the heavy growth around the creek, but I did fairly well in two pools landing four small brownies, and losing three others before I brought them to hand. All were dark and colorful, but very small, seven to nine inches. The nine-incher appeared emaciated. Perhaps it was due to fall spawning activities, I'm not sure. The last section of creek I fished was very difficult. I remembered this section from my previous trip. It has a three foot deep pool at the head which flattens out to a shallow riffle before turning left through some boulders into another deep pool. The shallow riffles happen to lie under a small willow tree with overhanging branches. As I approached from below I saw several nine to eleven inch trout zip from the riffle just above the boulders; I had frightened them. That’s when I recalled this difficult riffle problem. It always seems to have large trout (for this size creek) working the riffle under the willow. It appears that the riffle has good gravel, which is likely the spawning redd of choice. After observing it for a while I noticed large trout over the gravel… but how to drift a fly through it? All this “fish stalking” was wearing me out. Four-plus hours of creeping and crawling, stooping and kneeling had worn out this fifty-year-old body. Stopping to think about it brought the sore joints and muscles into my consciousness. I decided to try the reservoir. There were just two other vehicles at the reservoir. I quickly assembled my nine-foot rod and hiked to the stream inlet. I was able to wade the sandbar about fifty feet until it began to drop off steeply. 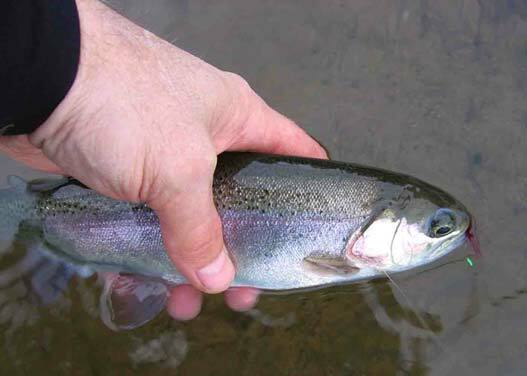 In about seventy-five minutes of fishing I landed six nice fish: five rainbows and one brown. I lost about five others due to hook pull-outs. The fish were deep, and I was using a fast sinking fly line. The strikes were coming deep, and the fish were strong and stayed deep until the end of the fight. Not much “jump” in them. Perhaps I was playing them too hard which was causing the pull-outs… don’t know. 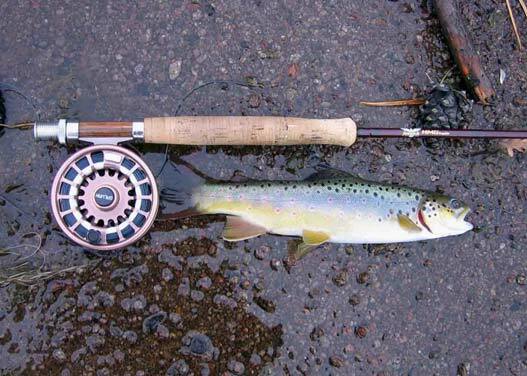 The one brown trout, obviously stocked, was of unusual color. It almost had an Atlantic salmon color to it, sort of a bluish hue. 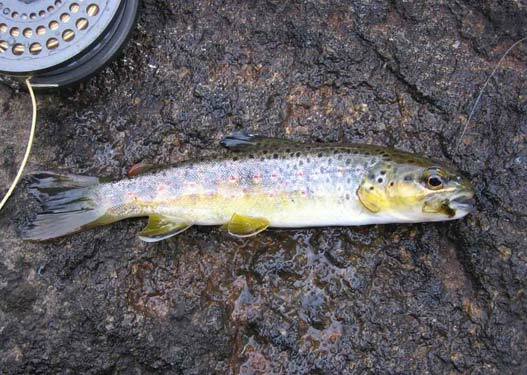 The red spots and adipose fin unmistakably disclosed it to be a brown trout. Having enjoyed the day, with ten trout landed and eight lost due to hook pullouts, I headed home at 3:30 pm and walked into the house at 6:03 pm, “Honey, I'm home.” Not fast and furious action, but good, steady action commensurate with the slow-down when fall slips into winter. Exactly what I expected it would be. 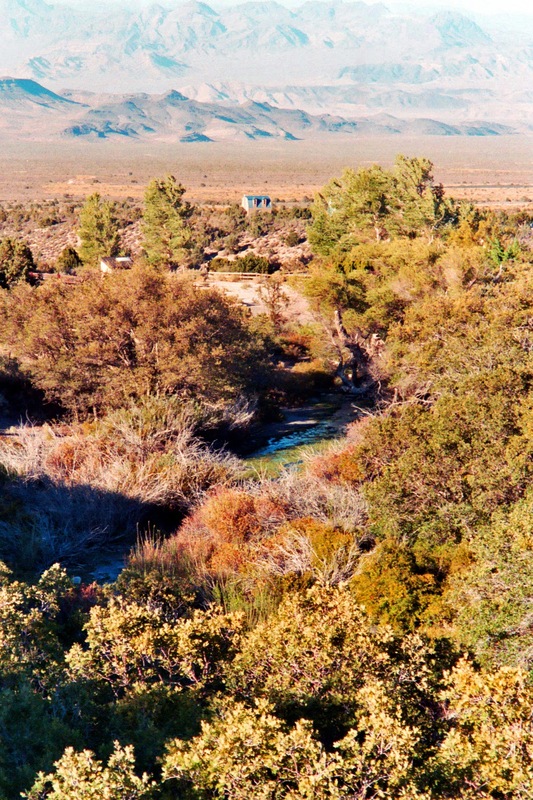 The view in 1977 looking north, from above Cold Creek spring. 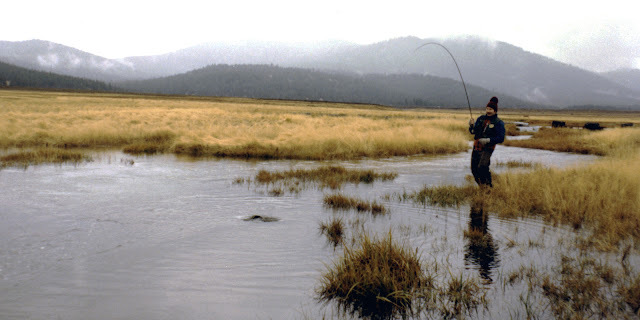 ﻿﻿﻿﻿﻿In 1977 when I was a junior in college I taught myself how to fly cast on an eight-and-a-half foot, seven-weight fly rod. 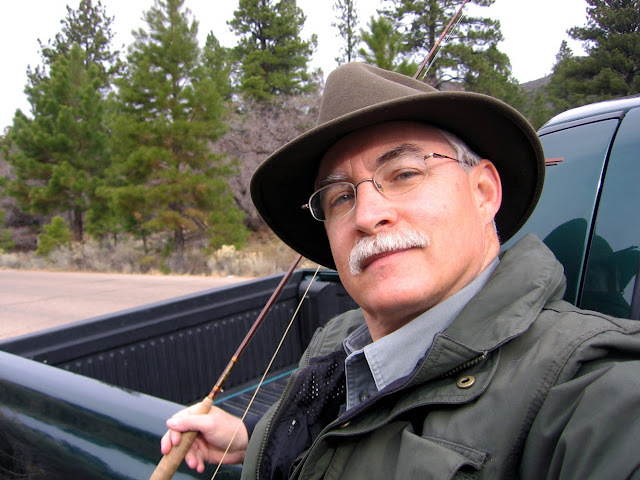 I had read a book by Joe Brooks about western fly fishing. Brooks lived in Montana where the rivers and trout were large, real large. Brooks recommended the eight-and-a-half foot, seven-weight rod for the wide, open rivers of the west. I was just 20 years old, what did I know about anything? I reasoned if it was good enough for Brooks, it was good enough for me. So, I ordered my first Fenwick rod from a mail order catalog. Wild horses making their way towards the dry pond. I practiced casting on my lawn until I couldn't stand the dry-casting any longer. I then drove my 1968 Volkswagen Beetle to Cold Creek to see if I could catch one of its small trout. 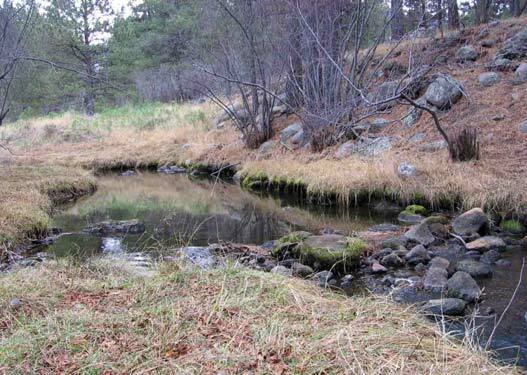 Kevin McGoohan and I had hiked the area often, and I had already seen the small trout dash for cover whenever we approached the creek. 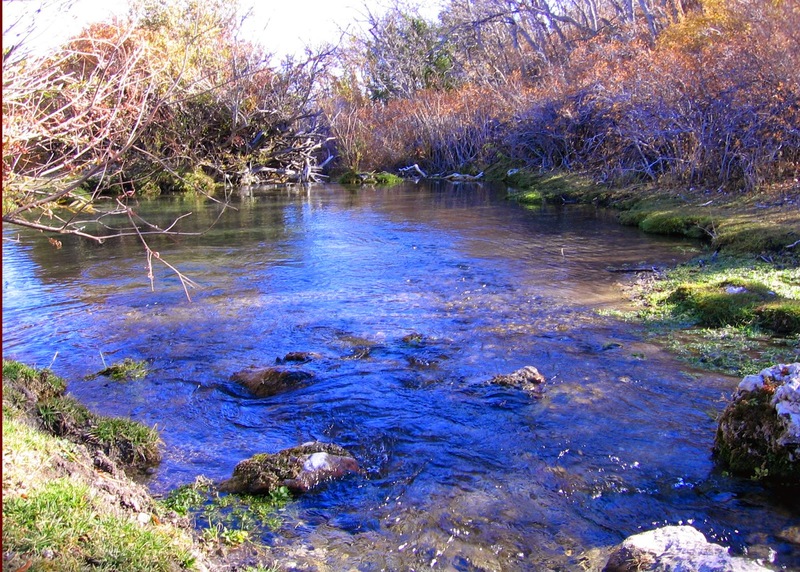 I began visualizing fishing “for real” in the absolute solitude of Cold Creek with my new seven-weight rod. You fly anglers can imagine the sight of this young kid with his long, heavy seven-weight fly rod heaving large size 12 dry flies into the tiny creek barely a couple feet wide. Regardless of the silly image it conjures, those small, wild trout attacked with abandon whenever I was able to put the fly on that narrow strip of water. Unfortunately, my brawny strikes with the big-water fly rod sent the little six-inch trout soaring through the air like birds. I felt awfully stupid and quite guilty for the terror I put these small Nevada trout through with that heavy "Montana" fly rod. Looking downstream, sentinel cottonwood to the right. Looking south, upstream, on Cold Creek. Fast forward twenty years later when I accidentally learned about a pond that the Cold Creek development had created to assist with fire fighting (helicopters dip water buckets into the pond to carry water to the fire fight). 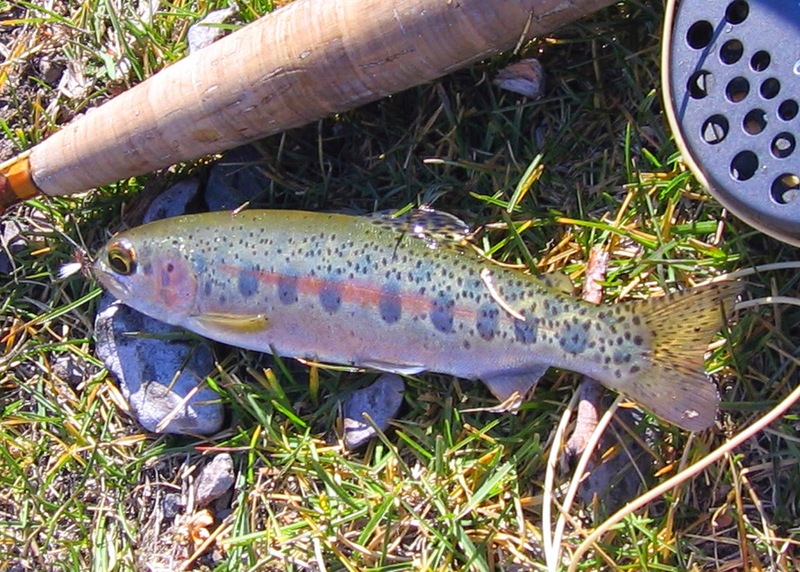 It seems the Nevada Department of Wildlife was stocking the little pond (maybe a couple acres in surface area) with rainbow trout. For the last three fall seasons I’ve awaited the stocking of the pond so I could run up there, sometimes stealing away early from work, to fish for nine inch stocked rainbows. If I hit it just right I sometimes could catch ten fish in ninety minutes. The first Saturday in November I decided to run up there early in the morning. I hadn't yet seen a stocking report, but I knew it had to be soon; besides, I could use the casting practice and a break from the city life. My plan was to leave the house at 7:00 am and be home by 11:00 am. With a sixty-minute round trip, the plan would afford three hours of fishing/casting. This area is now a Mecca for ATV’ers who often drive their motor homes up for the weekend, and I had to negotiate through a small motor-home enclave on my way to the pond. 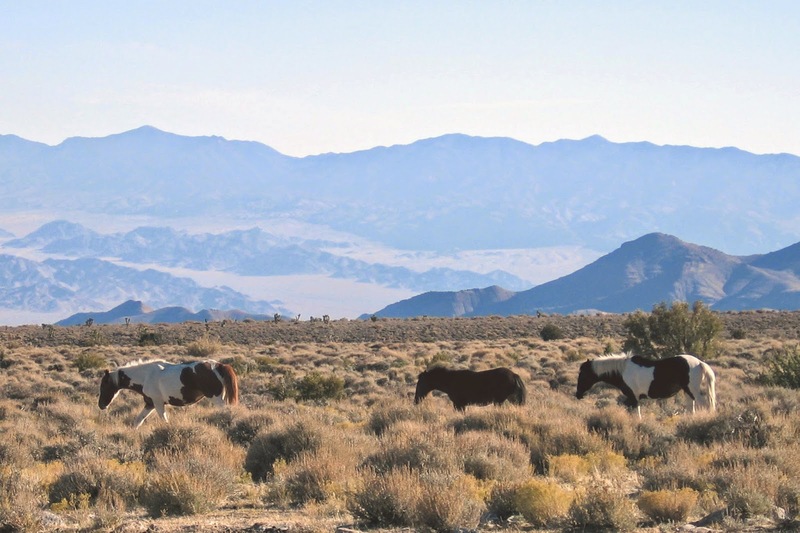 Driving down I noticed a small herd of seven wild horses that was making its way to the pond, or so I thought. 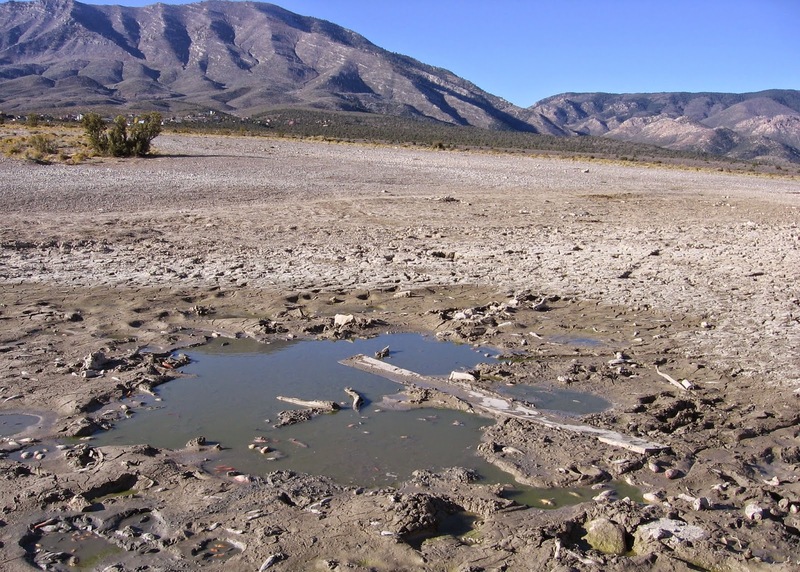 Upon arrival at the pond I discovered that the irrigation ditch had been blocked and the pond was dried up. All that remained were a few mud holes in which some small Koi fish were flopping around. All the trout were dead, as were a few perch or similar sunfish. As I walked the perimeter of the pond I discovered a dead horse caked in dry mud. Perhaps it got stuck while wallowing in the silty remnants of the pond. The whole site was quite sad. But, not wanting to waste an opportunity I pondered the idea of sneaking onto the private property containing the creek headwaters. The sense of revenge for that cranky old security guard came over me, as well as the thought of “sticking it to the man” (whoever he was). I decided to see if it was possible. So at 8:00 am I found myself snaking through the private drive switchbacks as they traversed several arroyos. I parked alongside a utility shed just above the spring that fed the creek. I quickly descended into the bottom of the creek bed. I was glad to see that for the most part it remained unchanged from two decades ago (except for a park bench here and there along accessible shoreline). I was wearing rubber boots so crossing the creek was no problem. In doing so I spotted my first glimpse of a speeding mini-trout as it dashed for cover into the watercress beds. Watercress beds are a distinguishing characteristic of Cold Creek. I had heard that some folks collect it for use in salads. 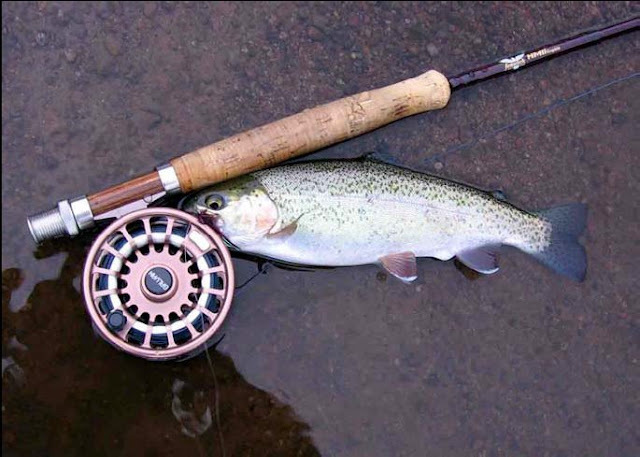 Six-Inch rainbow parr fooled by a parachute Adams dry fly. Enthused by that first trout sighting I quickly strung-up my little fly rod and on my third cast I was right into a little rainbow (seven inches). I quickly caught and released two other little trout as I worked just below the old cottonwood that used to stand as a sentinel over the watercress beds (it has since been reduced to a stubby stump as Cold Creek residents apparently tried to save it by sawing off dead limbs). As I worked another fifty feet downstream I came across a little pool that was obviously man made. Not wanting to be too obvious by fishing from the clearing lest I get thrown off the private property, I decided to continue casting downstream from the head of the pool. I was using a little size eighteen parachute dry fly and was finding success by floating the fly down to the trout. I quickly set the hook into another six or seven inch rainbow as the fly swung out after reaching full extension. It was after five or so casts that I observed what appeared to be a larger fish working in the middle of the pool, and within two more casts I was able to set the hook on his strike. To my surprise it was a nine-inch rainbow, a huge trout for that little creek. Obviously, the man-made pool created a habitat that could support a larger fish. As I understand trout, their maturity has more to do with age than size and so they often are able to gain reproductive maturity at a smaller size (seven or eight inches), if that is all their habitat will allow. All they need is a steady diet of aquatic insects and pebbly riffles in which they can construct their spawning redds for their eggs to grow in the rich, oxygenated water. Other than that, size doesn’t matter much. 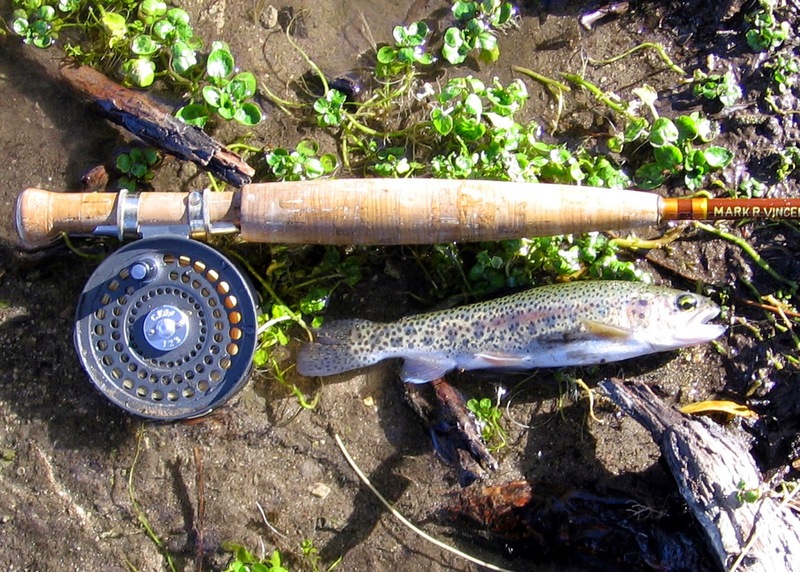 Nine-inch surprise rainbow from the larger pool, with parachute Adams dry. 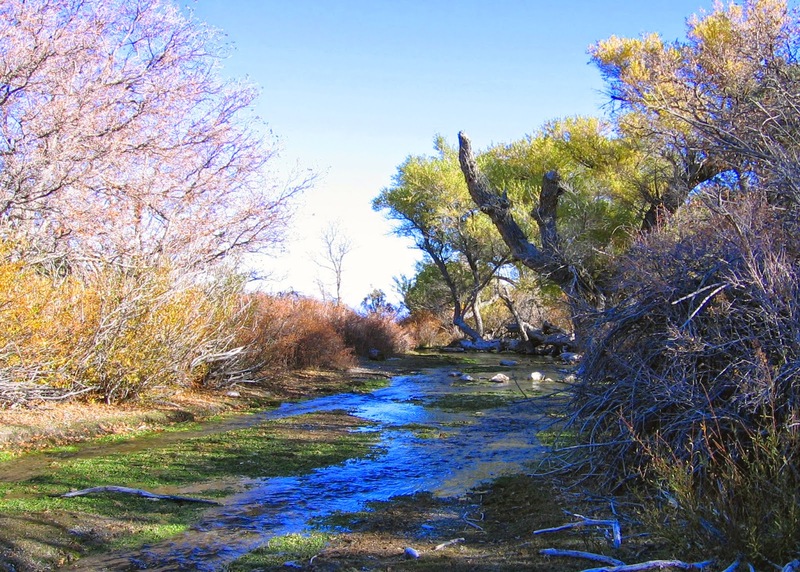 I began to work back up the creek, getting into position for the shallow pool in the shadow of the sentinel cottonwood. 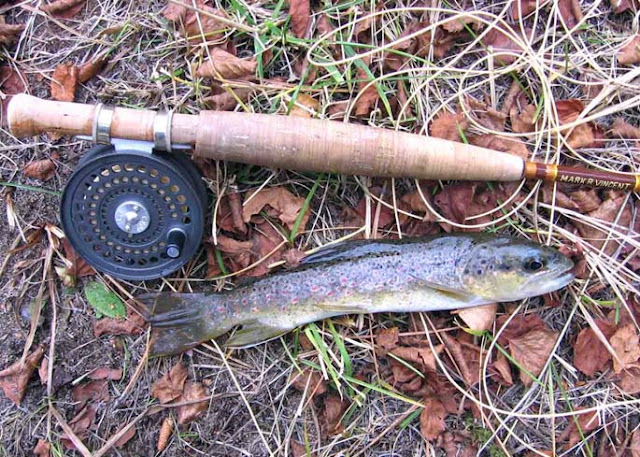 Getting a little greedy and aggressive I was able to land three more little trout, and actually caught a little fingerling of three inches or so (a size eighteen fly is very small… I’ve caught minnow on flies that small before). I believe that fingerling was evidence that the trout are naturally reproducing in the creek, which is consistent with my observation from twenty-six years ago. Unfortunately, working this pool exposed me to the dirt road at the head of the little canyon above the spring. Several cars drove by, and I assume at least one saw me. Just as I decided to give it up, I heard an ATV quad coming down into to creek. I assumed he was looking for me, but I had already started my assent out of the canyon through the willows and juniper. I admit I experienced some relief when I got into my truck before he came back up and sighted me. Maybe I was anxious, but I didn’t want a confrontation of any sort to ruin the wonderful ninety minutes I had fishing this little hundred-foot section of Cold Creek. But it was so delightfully nostalgic and genuinely enjoyable fishing (albeit for tiny trout on a tiny fly rod) that I doubt anyone’s harsh words would have ruined it for me. Large, deep man-made pool downstream from the cottonwoods. Dried out Cold Creek pond, looking southwest towards Wheeler Pass. 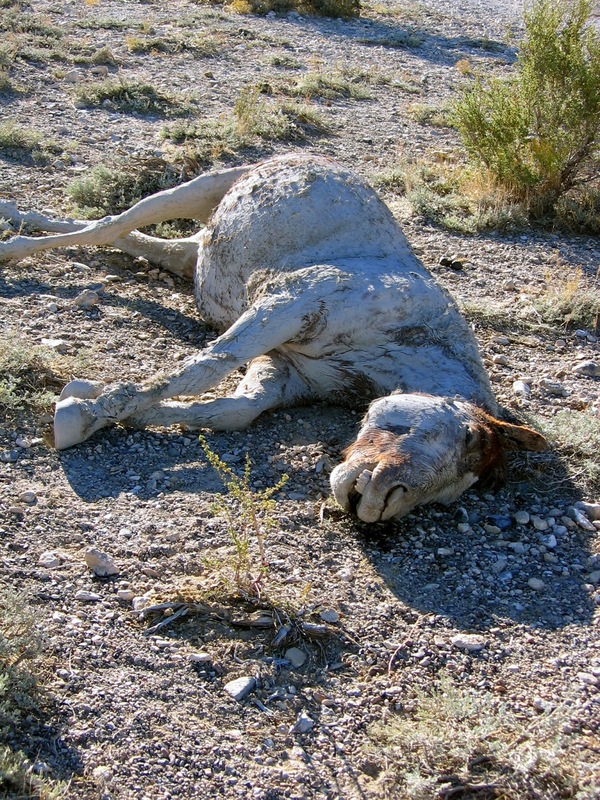 Dead feral horse caked in mud near Cold Creek Pond. 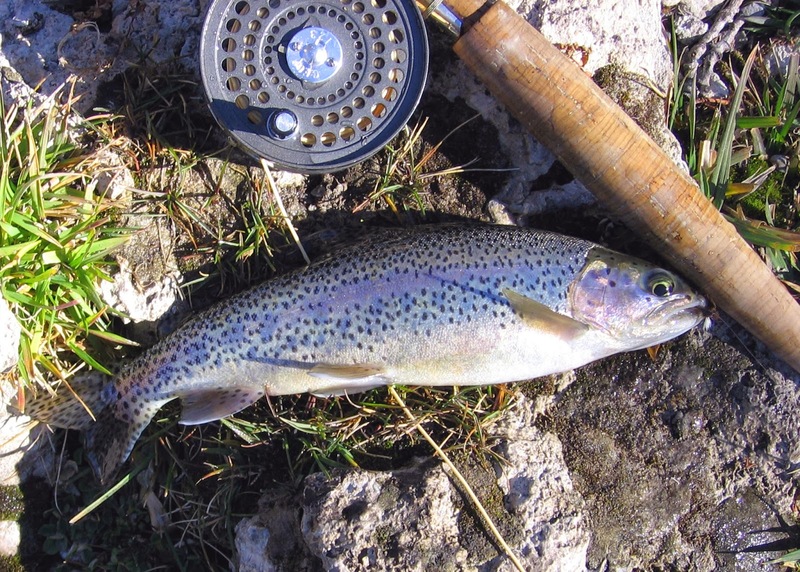 Your wild Cold Creek rainbow trout.